Hi! My name is Zoe Elle Vidgoff and I reside in the beautiful Rad Rocks of Sedona Arizona. 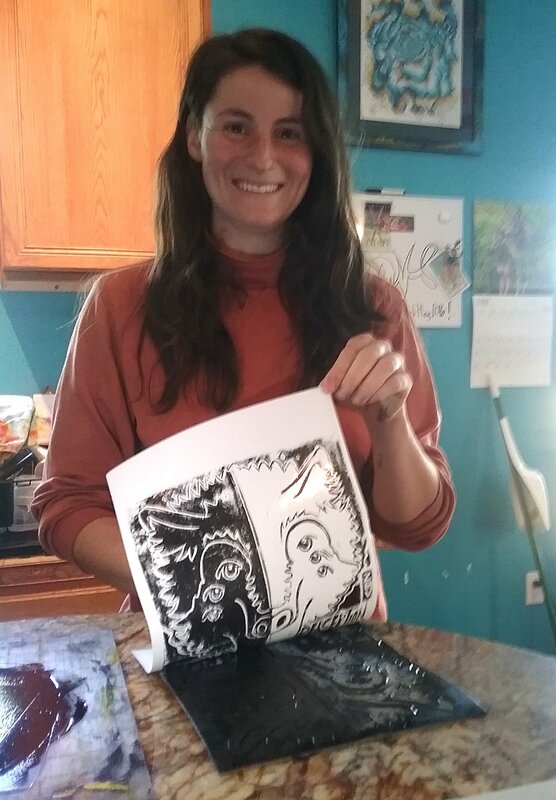 I am an artist of many mediums, including ink illustration, twisting copper wire, and linoleum stamp carving. I find my inspiration comes from observing and enjoying the natural world. Even walking out my back door fills my mind with an infinite array of possible compositions. I’ve been working on art all my life, but in the last decade my desire to make a difference has expanded to include the whole world. My intention with this art is to spread it across the globe and help raise the vibration of all the Earth’s inhabitants. It is of the upmost importance! Welcome to a world of color and surreal creatures. Ink flows where my ideas go and I often don’t know our destination until the end. Through this medium I discover a lot about myself. I love to go exploring for crystals and minerals. Then I am compelled to come home and twist them up in metal and twine! Hand carved and hand stamped! The original SAVAGE WOLF “Beyond Perception” T-Shirts for all Ages!